.......53 Buddhas and Me .................My Life Adventures.....: 53 Buddhas ?? When I first started writing this blog I was at a loss as what to name it. I was sitting in my living room and looked around the room at some of my many Buddhas. After counting them I had the name. I haven't counted them since but I would have at least 63 now. As you may have guessed I LOVE Buddhas. This photo is of a Buddha statue outside a Buddhist Temple in Vancouver. The statues inside the temple were beautiful but understandably I was not allowed to take photos inside. This guy was outside in the garden so he got my cameras attention. That sure is a lot of Buddhas! Now I know where you got your blog name from. Bet you'll never guess where I got my blog site name from! LOL just kidding! How's your calf? I hope that you're getting on much better now. Have a great evening (?) it would be by now there... I think! How about just have a great one? That works! How many hours difference are we? Yes I do love Buddhas, not sure why but I always have. 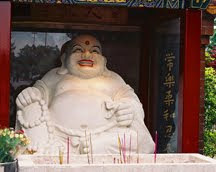 Penniwig - yes I must say I think I resemble larger buddhas than the slimmer. Darlene - my calf is feeling about 90% now. I think the time difference between is I am 18 hours in front of you. I'm with SuZen ... I'd love to see a pic of all of your Buddhas too.